Our goal at Maple Court Cottages is all about our cottages and you and our ability to supply you with many conveniences of your home in a smaller space including satellite TV. We offer a quiet country setting but are still only 2.5 miles from all the amenities of the Town of Port Dover, Ontario, Canada where you can buy anything you will need for your stay. Our many repeat customers are proof that we fulfill our promises. Our cottages are on lakefront property with a shale beach and all have lake views! All units are completely furnished and fully equipped, winterized and non-smoking with many upgrades. They are available year round. We are pleased to include 3-Piece Baths w/Shower, Kitchen, Dinette, Living Room, Satellite TV (with 5 movie channels), Screened In Porches, Decks, Charcoal BBQ’s, Picnic Tables and Fire Pits. 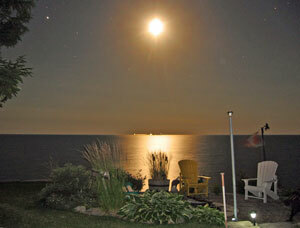 The cottages are situated in a serene and picturesque country setting on Lake Erie. Several terraces offer private & spectacular views of the lake. Bring your lunch/dinner and your camera and enjoy the views or build a campfire and watch the reflection of the moon and stars on the sparkling waters.